Offset angle prevents wrist strain while removing and replacing dumbbells. 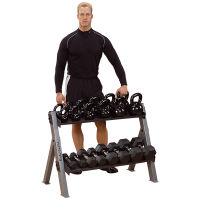 Individual dumbbell cradles improves rack safety profile. Dumbbell saddles made of wear resistant high-density polyethylene plastic. Full shelf prevents dumbbells from falling though. Storage space for 10-pairs of any size dumbbell. 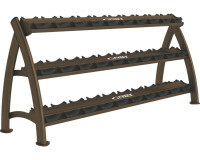 Six plate storage pegs. 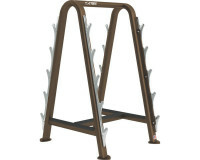 Polymer bumpers on storage pegs protect frame finish from plates. Six zinc-coated plate storage pegs. 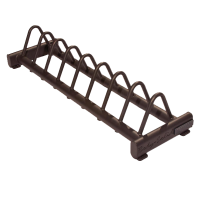 Polymer bumpers on storage pegs shield body finish from plates Merchants two Olympic bars vertically for highest area effectiveness. 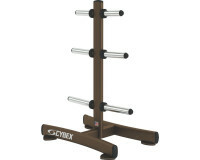 Holds 10 barbells. 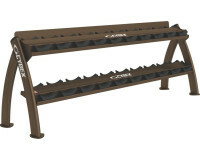 Upright design provides more ergonomically correct racking of barbells. Offset angle prevents wrist strain while removing and replacing dumbbells. 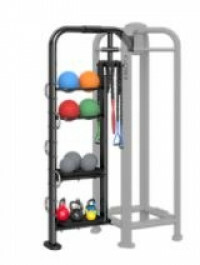 Individual dumbbell cradles improves rack safety profile. Dumbbell saddles made of wear resistant high-density polyethylene plastic. Full shelf prevents dumbbells from falling though. Storage space for 15-pairs of any size dumbbell.